Find and compare the best prices from a range of well known car rental companies at Szczecin-Goleniow Airport. This is a free to use facility, enabeling you to book direct with the company quoting the price. A direct rail link between the airport and Szczecin was opened in 2013 giving a 40min journey time into Szczecin. A bus service to and from Szczecin timed to suit certain flights costs approximately 14 PLN (approximately 3 Pounds). 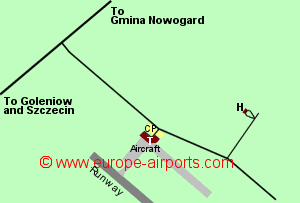 Szczecin-Goleniow airport has a 4 bars/cafes, 6 shops, a cash machine, post office, free WiFi Internet access, mother and baby room, an exucitive lounge and a VIP lounge. The Pilot's Hut Motel is situated within the airport grounds, approximately 1km from the the Terminal building. 578,000 passengers were handled by Szczecin-Goleniow airport in 2017, a 23% increase from the previous year.